It’s that time of the month again – the release of my ‘freebie’ coloring template in the Angela Porter’s Coloring Book Fans facebook group. Autumn is my favourite time of year and Hallowe’en is my favourite ‘festival’. Not the dressing up or trick or treat and rowdiness, though I do appreciate the excitement that the little ones have about the spookiness and slight scariness that it all brings. I just enjoy the atmosphere at this time of year that the darker nights and changing colours and falling leaves bring. It’s the time of year where I really appreciate candle light during the evenings, creating a cosier environment at home. There’s a little more to it than that, but I can’t quite find the words for it at the moment. Anyhoo, this whimsical, cute colouring template is available only to members of the Angela Porter’s Coloring Book Fans facebook group. It’s free to join. I create one template a month just for the members (sometimes I surprise them with a second one, and in the run up to Christmas I try to do a couple a week to help with de-stressing). Pop over and join a fair number of like-minded, friendly people. Happy Hallowe’en and a Blessed Samhain to everyone! 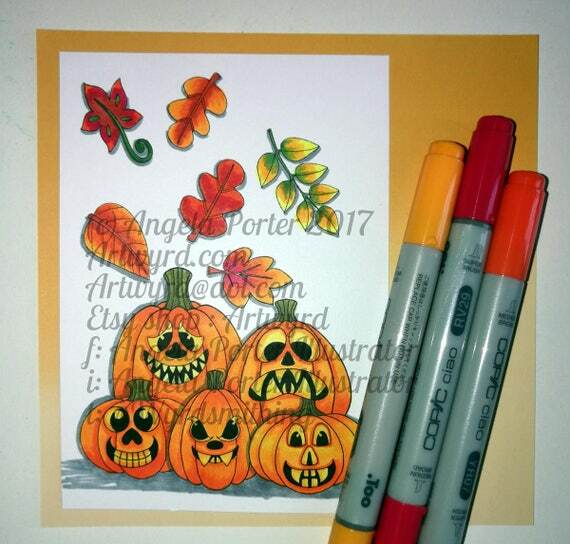 I have a set of 13 digi stamps with a whimsical Hallowe’en Pumpkin theme available in my Etsy shop, Artwyrd. Use them to create cards, or to fill a page with images for a custom colouring page, or any other craft you can think of. I have been adding new items to my collection on Vida. All feature my artwork, and the collection includes tops, scarves, wraps, bags, jewellery and tapestries. There’s a 40% off deal until midnight PST 30th Sept; use the code BESTEVER to get the discount! This isn’t available with any other offer. Also, there’s offers on my collection until the 10th October 2017. The code WELCOME-25 will give you a discount of $25 off orders over $75, and the code WELCOME-75 will give you $75 off orders over $200. 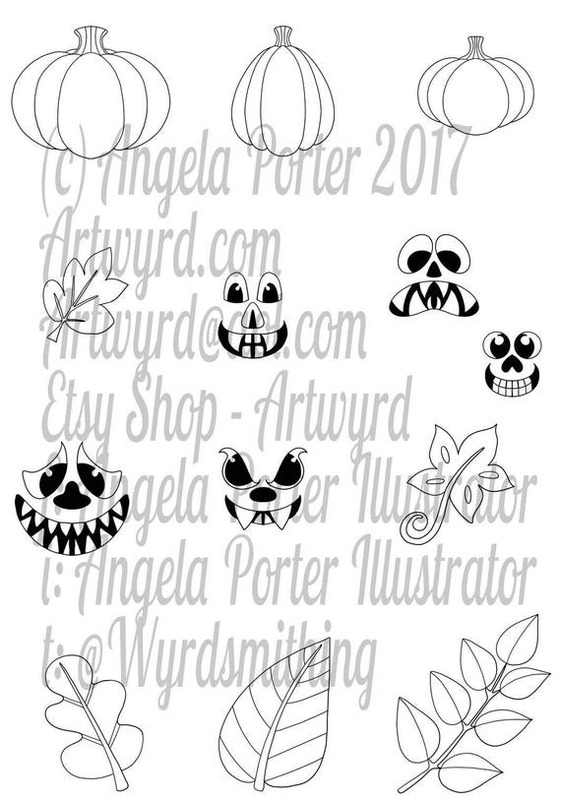 Autumn Mandalas, a collection of ten Autumn and Halloween themed designs, is now available in Colorist! Colorist is an app for Windows that allows you to colour in the templates as if you were using pencils or gel pens! 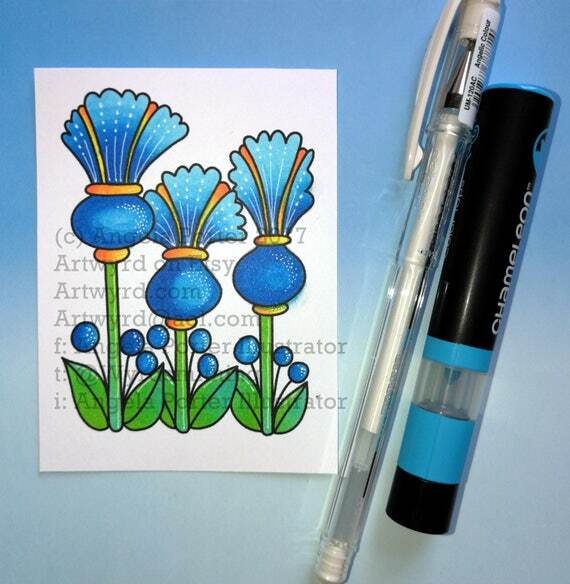 There’s now a total of eight digi stamps of whimsical, simple flower designs available in my Etsy Shop, including the one to the left. The large open spaces in the designs mean you can go to town on shading, or you can add doodles or patterns. The beauty of digital stamps is that you can print them again and again on paper that is best suited to the media you’re using. Also, you can re-size the image to suit the card, picture or other item that you’re making. Not only that, these can be layered as the background is transparent, but the flowers and leaves are white. A pair of lovely ladies who love my work have created a Facebook group for those who also love my colouring pages. They’re Krystal and Brett. Why not pop across there and join up! They’re determined to make it a friendly, kind nook on the internet. It’s in it’s early days, so will grow and develop as Krystal and Brett work on it and with the members. One thing I can guarantee is that I’ll create unique colouring pages just for members of that group! The first one will be live on the page very soon. I also know they have a poll on the go to find out what you, the colorists, would like as theme for my next book! Also, I’ll wander through there from time to time, though I don’t think I’ll have time to comment about everyone’s beautifully interpreted and coloured templates, I’m sure to leave a comment to let people know I’ve take and least a quick peek and answer any questions pointed in my direction. I finally got the dragonfly artwork finished as a vector graphic. How frustrating was that? Every line drawn as a series of points. It took me days to re-draw a drawing that took just a day or so to draw. Still, I’ve learned how to do it, I have a request for some other bits and bobs, as well as a suggestion that I should create vector graphics and sell them as there’s a market out there for that kind of thing. Something else for me to wrangle with! Someone has suggested that my designs would make lovely embroidery patterns. I’m not an embroiderer, nor do I have a clue about what to do, but if there’s anyone out there or if any one knows someone who’d like to work with me to do this then please either contact me or suggest they contact me! I already have a few cross-stitch designs available via Paine Free Crafts. All this means I feel like I’m getting a little overwhelmed at the moment. Learning time management seems to be something I have to do sooner rather than later. Between working on things for Etsy, sorting out a collection at Vida, doing Vector graphics, completing the Autumn mandalas for Colorist, and everything else, I’ve not had time to play with the 3D forms or other ideas I have.